Seoul (AsiaNews) - The Christmas tree decorated with a cross will illuminate even North Korea once again this year, after a seven year gap that failed to have born any fruit. 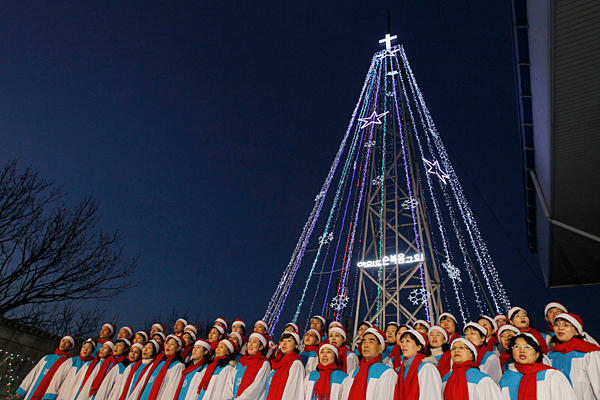 The Seoul government, in fact, has granted permission to a group of Christians to build a new tree on Aegibong Peak, a hilly area less than 3 km from the border that separates the two Koreas. A government source said that the Ministry of National Defence has accepted the request because the tree "represents well the spirit of the holidays." The tree lights will be turned on December 18 to 31, according to some sources, and will be visible to most of the local population of North Korea. For this reason, the Seoul government had imposed on the organizers not to light the tree, seen as a provocation. This year, after several military provocations by the Pyongyang regime, the "Blue House" has given its permission. The Rodono Shinmun newspaper of the North Korean Workers' Party, has attacked the decision: "The puppet military authorities are clamouring about lighting the Aegibong Christmas tree, their anti-Republic psychological warfare is now at full tilt."